This Catholic Order of Foresters Health Insurance Company Review investigates Naperville, Illinois-based Catholic Order of Foresters. The fraternal organization distributes and markets products and services through a 300 plus insurance broker and agent network in 31 states and Washington, D.C. Members have the opportunity to participate in 400 organizational courts for the benefit of social, financial, educational, and religious events. If you pay too much for health insurance rates, you are not alone. Take a moment to get competitive health insurance quotes to save money on your health insurance today. Enter your zip code to request health insurance quotes! The Catholic Order of Foresters provides scholarship funds ($600 educational awards and $5,000 scholarships) to Catholic students. The organization also offers matching funds for a number of member-identified worthy causes. Membership of 133,000 plus people offers the Catholic Order of Foresters significant financial services buying power. Clients may call the company’s customer service line between the hours of 8:00 a.m. and 4:00 p.m. Central Time, Monday through Friday. Members receive access to inexpensive Travel Care ™+. The program offers Forester members with accident and travel insurance benefits, including accidental death insurance coverage. Members traveling on public transport, including licensed passenger buses, trains, and airplanes, receive $5,000 insurance protection at a one-time $15 cost. The insurance does not require a medical exam for members, and is a benefit of membership. The member benefit is not available in Washington, California, Colorado, Montana, Oregon, Pennsylvania, or Maryland states. Members also receive newborn benefits, orphan benefits, and a prescription medicine discount program. Agents of the Catholic Order of Foresters offer a variety of traditional health and medical insurance plans to their members. By providing a comparison of health insurance programs, members of the Catholic Order of Foresters hope to save money on health insurance rates. The organization operates as a non-profit fraternal organization. At fiscal year-end 2010, the organization reported $170.4 million in sales and net income of about $7.8 million. 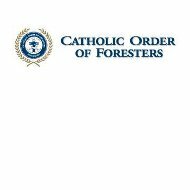 Catholic Order of Foresters has about $756 million in financial assets. The Boston chapter of the Catholic Order of Foresters, a major U.S. Catholic parish center, generated approximately $14 million in sales in fiscal year 2010. The organization generated more than $43 million in investment income in 2010. The CoF has written approximately $2.8 million in insurance contracts. A.M. Best ranks the organization “B++” (Stable Outlook) in 2011. The Catholic Order of Foresters competes most directly with Modern Woodmen and Woodmen of the World Life Insurance. The organization competes with Thrivent Financial, Nationwide, and Royal Neighbors of America on a regional basis. In addition to health and medical insurance policies, the Catholic Order of Foresters markets and distributes term and whole life insurance policies, universal life insurance, and annuities. The Catholic Order of Foresters was founded in Illinois in May 1883. In 2011, it is the third largest Catholic fraternal organization in the United States. According to the organization website, the Catholic Order of Foresters helps its members achieve financial stability while providing ways to enhance social and charitable opportunities. The organization was founded with the values of recognizing, listening, encouraging, fostering, offering, responding, maintaining, and respecting Catholic Christian values and ideas. Caring for members’ spiritual needs is one of the ways the Catholic Order of Foresters hopes to help individuals, families, and communities prosper. The organization raises funds to benefit communities and “courts” established throughout the United States. The courts identify Catholic charities and causes and provide financial assistance to them. In addition, the Catholic Order of Foresters hopes to make church building loans to parishes throughout its markets. Interested parishes should contact the Catholic Order of Foresters for more information about CoF loans and terms. Catholic Order of Foresters’ members may give their parish financial gifts through funding vehicles, such as annuity contracts. CoF agents help parishioners with charitable gifts, retirement plans, and estate tax plans. Do not pay too much for health insurance. Compare your current health insurance rates with health insurance quotes from other insurance companies. It is easy to request free information—just type in your zip code to get started today!